Allen, Libby, “Finding Nostalgia Through Color.” Art New Orleans Magazine, 2012. Graves, Jen, “Art in Transit.” The Stranger, 6 March, 2012. 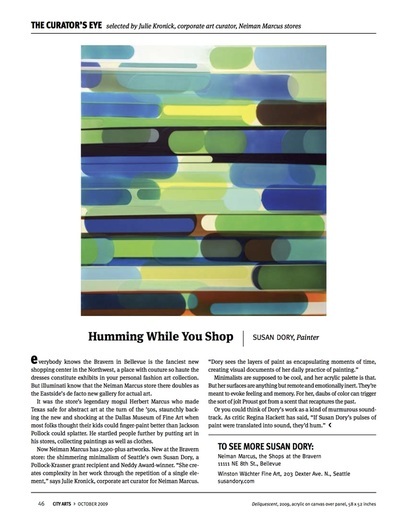 Kronick, Julie, “Huming While You Shop.” Seattle City Arts, October 2009. Vivre Voyager, “Pop Goes the West.” Summer 2008. Rowe, Lindsey, “Artists We Love.” Seattle Homes & Lifestyles, April 2008. Kangas, Matthew, “Creating and Enjoying Art for the Sake of Art.” Seattle Times, 17, February 2006. Hackett, Regina, “Susan Dory’s Grids Set Their Own Rhythm.” Seattle PI, 27, January 2006. Kangas, Mathew, “Abstractions and Revelations,” Seattle Times, 8, July 2005. 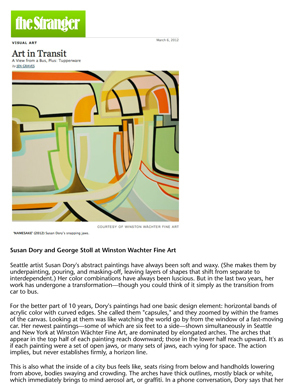 Hackett, Regina, “Abstraction is a good sign for Winston Wächter,” Seattle Post Intelligencer, 8, July 2005. 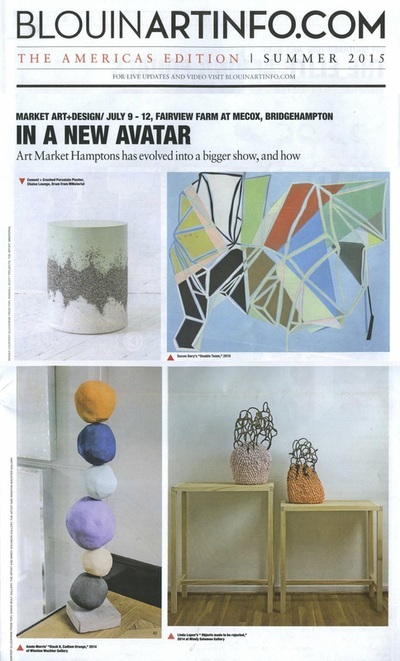 Kangas, Matthew, “Young Stars and Abstract Stripes Captivate in New Group Shows.” Seattle Times, 12, December 2003. Hackett, Regina, “YSA.” Seattle Post Intelligence, 12, December 2003. Johnson, Ken, “Dreamy.” New York Times, 26, April 2002. Thompson, Sandy, “Surface Tension at Mills College.” Artweek, April 2002. 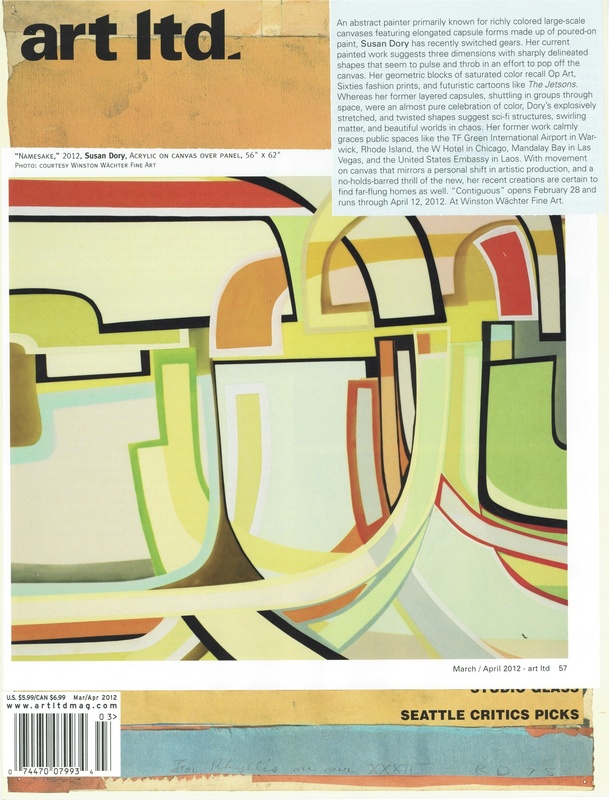 DeVuono, Francis, “Abstraction at Winston Wächter Fine Art.” Artweek, April 2002. 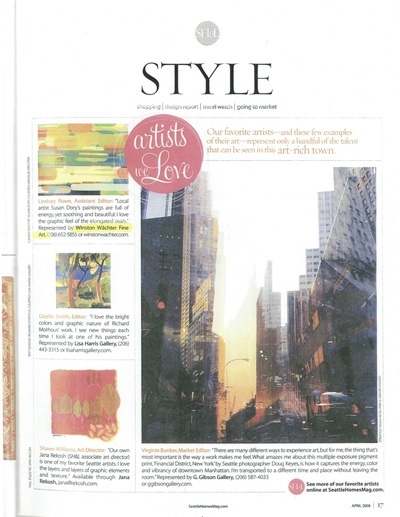 Kangas, Matthew, “Abstraction.” Seattle Times, January 2002. 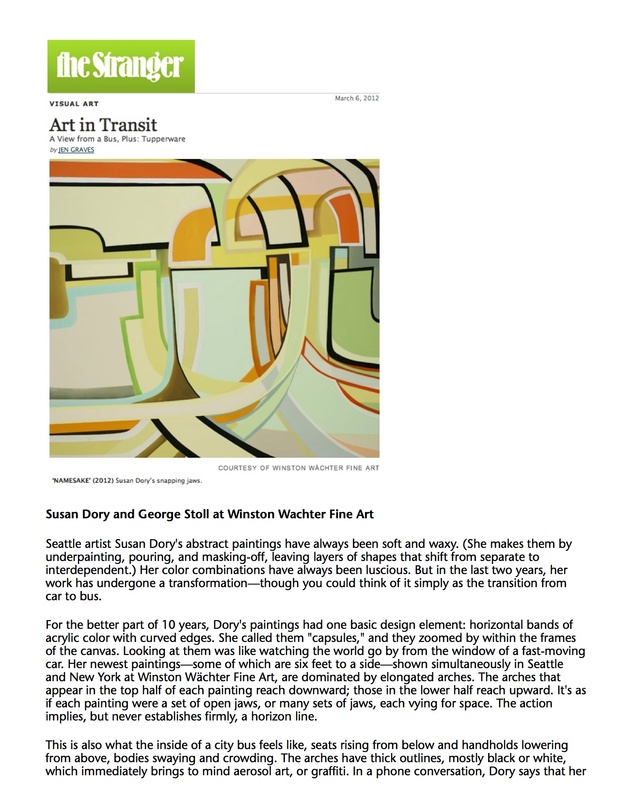 Golonu, Berin, “Jill Weinstock and Susan Dory.” Artweek, June 2001. Kangas, Matthew, “Susan Dory at Howard House.” Art in America, September 2000. Kangas, Matthew, “Four young artists embraced the pleasures of the abstract world.” Seattle Times, 14, April 2000. 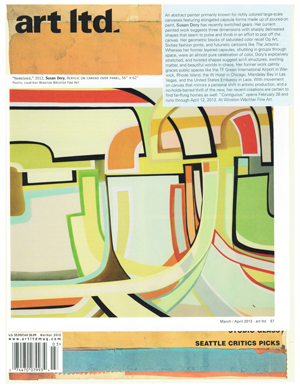 Hackett, Regina, “Stream of Fluid Abstraction Connects Engaging Works by Trio of Local Artists.” Seattle Post Intelligencer, 21, April 2000. Fredrickson, Eric, Art Bio, The Stranger, 6-12, April 2000. Rose, Cynthia, “Air Hockey.” Seattle Times, 2, December 1999. Sims, Lowry New American Paintings, The Open Studio Press, Dec/Jan 1999-2000. Kangas, Matthew, “BAM NW Annual.” Seattle Times, June 1999. Kangas, Matthew, “Bold in Bellevue.” Seattle Times, July 1998. Hackett, Regina, “Northwest Annual at BAM is Nice Surprise.” Seattle Post Intelligencer, July 1999. Kangas, Matthew, “SAM’S RSG Offers Sales - and Shows Too.” Seattle Times, July 1998. Bell, Clare, “New American Painting.” The Open Studio Press, Oct/Nov 1997. Kangas, Matthew, “Pleasant Changes Enrich BAM.” Seattle Times, July 1997. Updike, Robin, “Bellevue Annual Sparks Vitality of Art Scene.” Seattle Times, June 1997. Bryant, Elizabeth, “Six of One, Half Dozen of the Other.” Art Access, December 1996. Time Capsule, “A Concise Encyclopedia by Women Artists.” Creative Time/ SOS International, DAP, 1995.